Learning how to steer the vehicle the right way from the start is important – getting rid of bad driving habits is extremely hard. Learning various steering techniques starts with learning to position your hands on the steering wheel and choosing the most appropriate position for every possible driving situation. Once you have that down, you can learn a number of different steering methods, such as the hand to hand steering technique (pull-push steering) or the hand-over-hand steering technique. 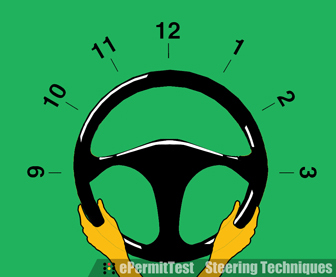 We will also look at one hand steering and fixed input steering, although you should only use these techniques when appropriate. Let's go over hand positioning in more details. Placing your hands in positions 10 and 2 used to be recommended by almost every driving instructor out there. In fact, this position is still listed as one of the recommended driving positions in drivers handbooks of many states. However, as more and more vehicles are equipped with airbags, some states began to issue warnings about the danger of this driving position. If you are involved in a traffic accident and an airbag is deployed, your hands may be thrown up into your face, possibly injuring you. If you are driving a vehicle with an air bar, we recommend that you do not use this driving position. Positioning your hands on the steering wheel at 9 and 3 o'clock is a great way to go for a number of reasons. First, it provides you with more leverage on the steering wheel than any other position. Second, placing your hands on the steering wheel in these positions will make sure that you will not receive injuries if the airbag deploys. This is also the position you would choose when you are using the fixed input steering method. 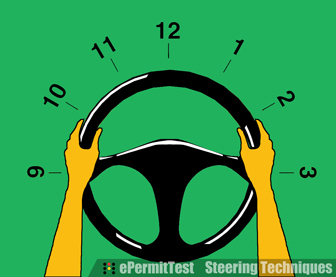 Another great thing about choosing positions 9 and 3 is the fact that these positions are accepted by every state around the country and you will never be penalized for using them during your driving test. In our personal opinion, this is the best way to position your hands on the steering wheel. 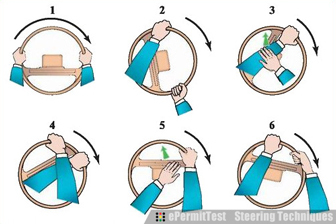 There is a lot of debate over placing your hands on the steering wheel in positions 8 and 4. Some argue that placing your hands in these positions will not give you enough leverage on the steering wheel and that this position can only be used for driving on a highway, where there's is not much maneuvering going on. However, this hand position is still recommended for vehicles equipped with airbags in many states. We advise that you use hand position 9 and 3 predominantly and change to positions 8 and 4 only when you need to let your arms rest a while. 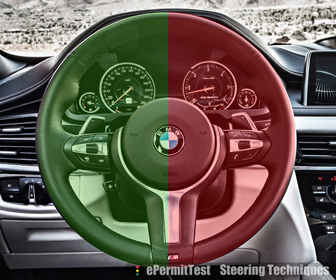 There are two main steering methods you could use: hand to hand steering technique and hand-over-hand steering technique. Other techniques, such as one hand steering or fixed input steering, are only used in certain situations. Hand to hand steering and push-pull steering is the same thing and it is totally fine to call it either way (some may even refer to this driving technique as shuffle steering). The main idea behind the hand to hand steering method is that your hands always stay on their respective sides of the steering wheel without ever crossing. This ensures that your hands will never get in front of the deploying airbag. While most people think that push – pull steering technique is used only for slow corners, it can also be utilized to tackle sharp high speed curves and it is likely to provide you with more control over the vehicle that the hand-over-hand method. When making a right turn, start by pushing the steering wheel clockwise with your left hand until it reaches position 12 on the wheel. 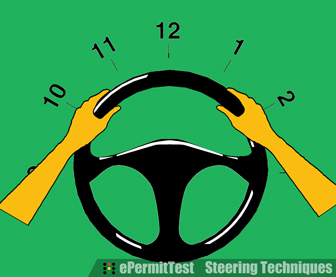 Your right hand should be gliding across the wheel and remaining in position 3. Firmly grab the wheel with your right hand and continue moving the wheel clockwise. At the same time, move your left hand to position 6. Once your right hand reaches the same position, you can continue moving the steering wheel clockwise with your left hand. 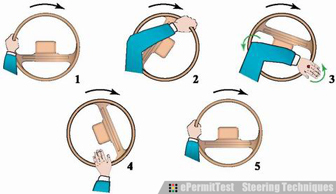 After clearing the turn, do everything in reverse order to return the steering wheel to the neutral position and your hands to positions 9 and 3. While hand over hand steering is the method utilized by most drivers and it looks more efficient than the push-pull method, it is really not and, while it is acceptable to use this driving technique during the driving test, we urge you to try and get accustomed to the hand-to-hand steering method from the start. 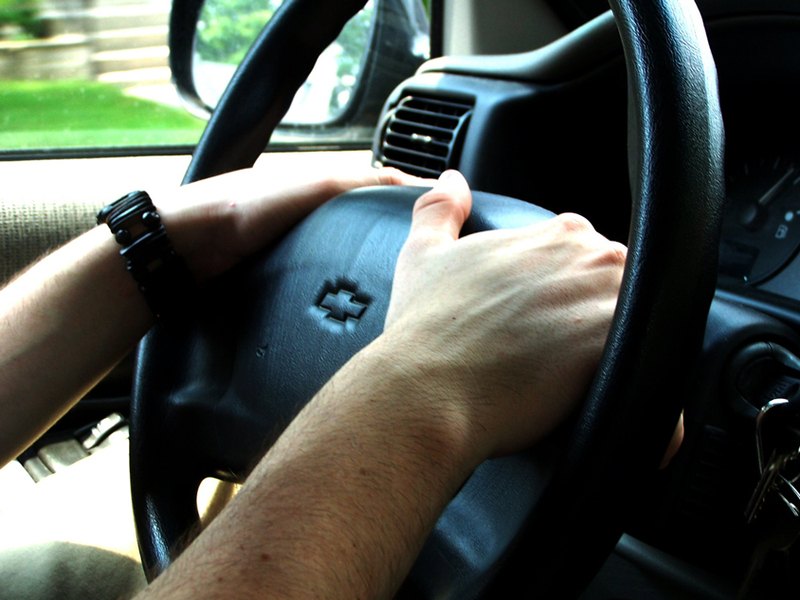 The hand over hand steering technique involves bringing your arms into the airbag operation area, should an airbag be deployed when you have your arms crossed, you will have them thrown into your face at the speed of 200 mph. To make a right turn using the hand-over-hand steering method, start with your hands in positions 9 and 3. Push the steering wheel clockwise with your left hand. Your right hand should move down with the steering wheel. Once your left hand reaches position 1, your right hand should release the steering wheel. Move your right hand over your left hand and place it in position 11 or 12. Grab the wheel with your right hand and continue moving it clockwise. Release the wheel with your left hand and prepare to rotate the steering wheel back to the neutral position once the turn is complete. Despite what many people say, one hand steering and left hand steering is acceptable in certain situations. Yes, most of the driver handbooks advise you to keep both hands on the steering wheel at all times, but this will not work when you are backing up or parallel parking. When you need to back up, the DMV explicitly states that you are not to rely on your mirrors and that you must turn and look over your shoulder. There is simply no way to look over the shoulder and keep both hands on the steering wheel at the same time. You are also required to hold the steering wheel with one hand when you are operating your windshield wipers, your headlights or when you are changing gears on a vehicle equipped with manual transmission.